The Heights, Brook Road, Witely, Surrey, as seen from Brook Road. The Heights was designed for Sir Henry Cole (1808-1882), who played such a prominent role in organising the Great Exhibition. The main architect was his eldest son Henry Hardy Cole (1843-1916), best known for his later Royal College of Organists, with its uniquely eclectic, highly decorated style. This Surrey house, however, rather than standing out, is very much in harmony with its setting, sharing the local preference for "tile-hanging ... and brick," if not for the half-timbering that was also common locally (Nairn and Pevsner 529). Cole is likely to have worked in close consultation with his father, and also with Cole's contractor John Kelk (see Sheppard, "Exhibition Building," footnote b). The house was completed in 1861. By the time of Cole's death in London in 1882, census returns show that the house had passed into other hands. 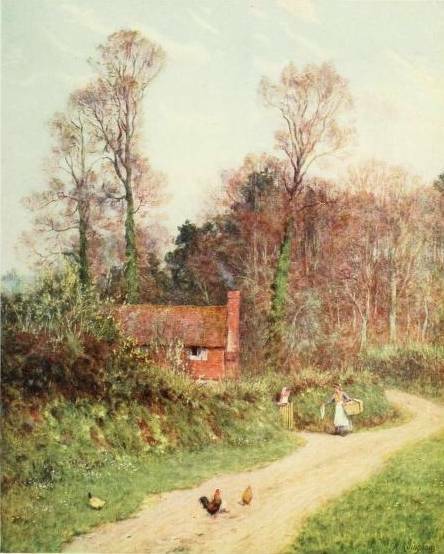 Left: The Heights of Witley, from a sketch by Mrs Helen Allingham (Cross, facing p. 216). Right: A Witley Lane, by Mrs Allinigham (Huish, facing p. 74). This was a charming house — The Heights, Witley, near Godalming. It stands on a gentle hill overlooking a lovely bit of characteristic English scenery. In the foreground green fields, prettily timbered, undulate up to the high ground of Haslemere in front, with Blackdown (where Tennyson lives) on the left hand, and Hind Head on the right — "Heights that laugh with com in August, or lift the plough-team against the sky in September".... A land of pine-woods and copses, village greens and heather-covered hills, with the most delicious old red or gray brick, timbered cottages nestling among creeping roses; the sober-colored tiles of their roofs, covered with lichen, offering a perpetual harmony to the eye.... About the house there are some eight or nine acres of pleasure ground and gardens. It quite fulfilled all expectations, as regards beauty and convenience of situation, though I am not quite sure that it was bracing enough for health. (215). At first, it did seem "bracing enough," at least for George Eliot herself. For example, "We went to the Heights, Witley at the beginning of June," she writes on 10 November 1877. 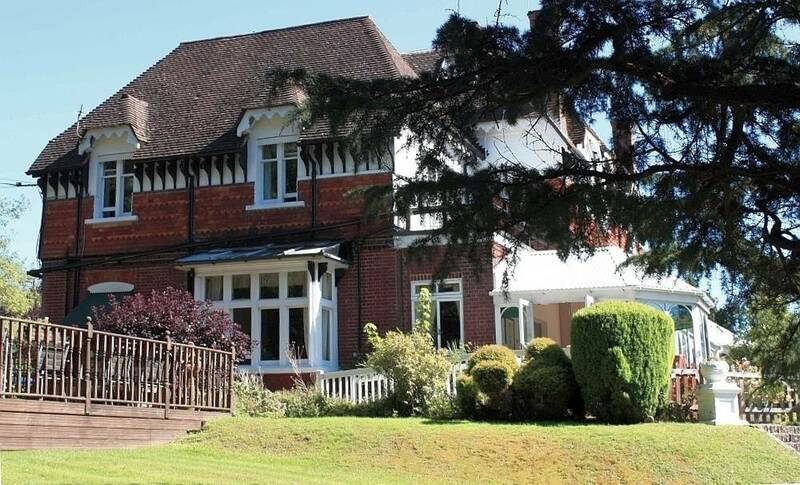 "We are at last in love with our Surrey house and mean to keep it. The air and abundant exercise have quite renovated my health" (qtd. in Cross 230). Here she wrote the essays that make up her last experimental work, Impressions of Theophrastus Such. But their new situation could not restore Lewes's health: "In our drives in the neighborhood of Witley, Mr. Lewes used sometimes to be suddenly seized with severe cramping pains. I think he was himself aware that something was far wrong" (qtd. in Cross 240). Before her new book could be published, they were forced to return to London, where he died at the end of that year. Eliot came back to Witley after her unexpected marriage to Cross, but was not altogether comfortable there, complaining of the wind and also the infrequent postal service. In April 1880, she wrote: "Mr. Cross has taken the lease of a house, No. 4 Cheyne Walk, Chelsea, where we shall spend the winter and early spring, making Witley our summer home" (qtd. in Cross 283). It seemed a sensible decision. However, she died suddenly in London, in December that same year. Later, Cross seems to blame Witley for the deterioration of her health (283). Nevertheless, the area still drew many who wanted to escape the hubbub of the city — particularly artists. In the summer at least, it would become one "vast Victorian open-air studio" (Short 203). The watercolourist Helen Allingham had stayed there during Eliot's lifetime; she and her husband are numbered by Cross, along with Tennyson and George Du Maurier and their families, as "within easy visiting distance" (241) of The Heights. Amongst the many local scenes Allingham painted is the one shown above, of The Heights itself. Soon after Eliot's death — and after their good friend Carlyles had died as well — the Allinghams totally abandoned their own Chelsea home, taking up permanent residence at Sandhills, just a mile away from Witley. They lived there from 1881-89 (see Huish 49; Trotter 90). Left: Western elevation of The Heights. Right: Closer view of the elegantly carved timber brackets. Not surprisingly then, houses in Witley could be rather special. Newly built ones could present a return to vernacular forms that was pioneering for this time. In its picturesque elements, such as the variety of asymmetrical roofing, the little turret over the stairwell, and its gables, The Heights compares generally with Morris's Red House, completed by Philip Webb in Kent just the year before. Such features place it very much in the vanguard of style for domestic housing, giving it a distinct Arts and Crafts flavour. The carved bargeboards, timber brackets at the eaves, and varying sizes and styles of window, all enhance this effect. Everything about it speaks of Victorian country retreat; but it could well belong to the later rather than the mid-Victorian period. Part of one of the Minton-tile texts that run around the north and east sides of The Heights, just above the ground floor level, and beneath the tile-hanging. Some features, however, are unique, or at least unusual. The text, HAVE MORE THAN THOU SHEWEST. SPEAK LESS THAN THOU KNOWEST, counsels against display, and comes from one of the Fool's speeches in King Lear, Act I, sc.4, ll. 132-3. Other texts follow round from it. While the Victorians liked to use these little reminders as decorative features, they were much more likely to be found round interior walls and over fireplaces, as in A. W. N. Pugin's earlier Grange, or set in tile flooring inside the house, as in the roughly contemporaneous extension of a house in the Yorkshire Dales. Left: Main entrance, with a small part of the same text just visible to the right, where the two drainpipes come down. Right: Sale or auction advertisement for the house in the Times of Wednesday 19 April 1933. The off-centre entrance to the house is another special delight, its curved hood held on timber brackets, matching (though not quite as elegant as) the bracketing round the eaves shown in the detail above. 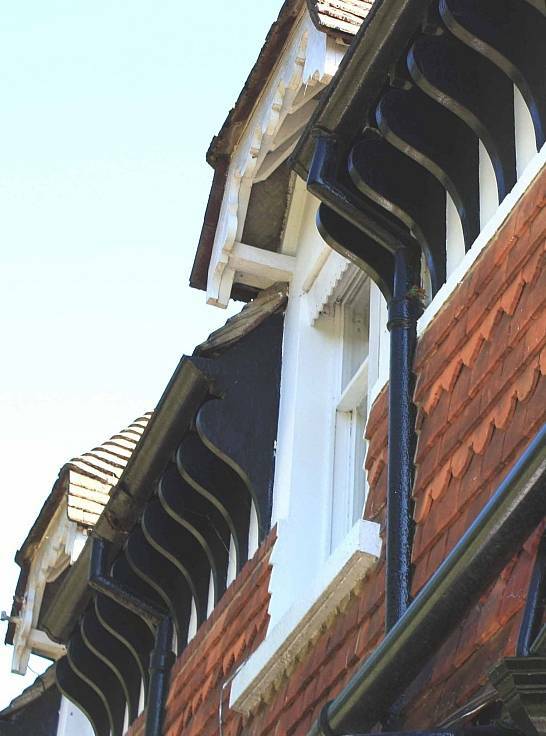 It would not be far from such features to, for example, the more dramatic cast-iron bracketing of C. F. A. Voysey's Arts and Crafts house in Bedford Park, of around 1890. Notice the barrel-vaulting in the porch and the lovely inner door with part-glazed surround leading to the main entrance hall and staircase. This is the stairwell clearly marked on the outside by the turret above the tall first-landing window. According to the advert in the Times shown above, the interior was very commodious, with an "oak-panelled billiard-room" and (at least by that date) a marble bathroom. 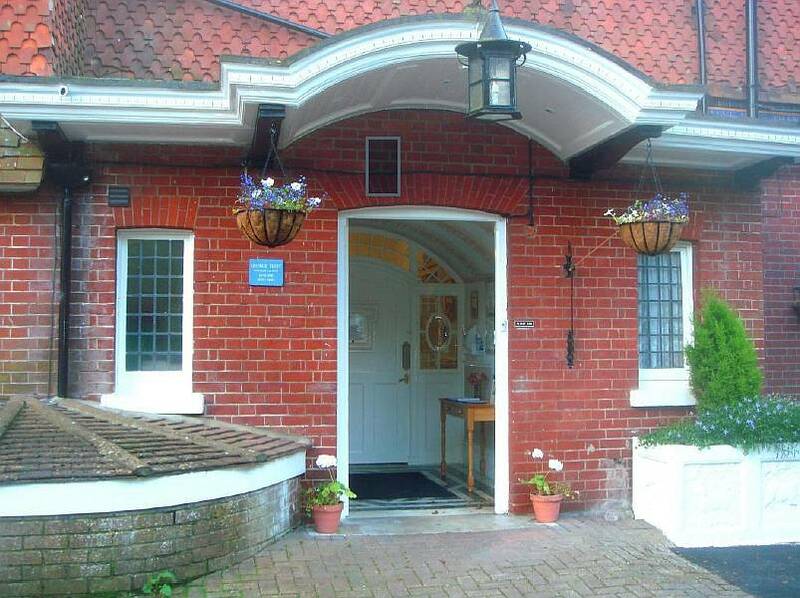 A current advert for the house as a care home describes the lounges as retaining "many of their original features." The latter site has a small slide-show showing splendid blue-and-white plasterwork on a ceiling, bright stained-glass patterned windows, and a particularly fine staircase. "At a Tempting Reserve." The Times, 19 April 1933, p. 22. The Times Digital Archive. Web. 15 November 2012. 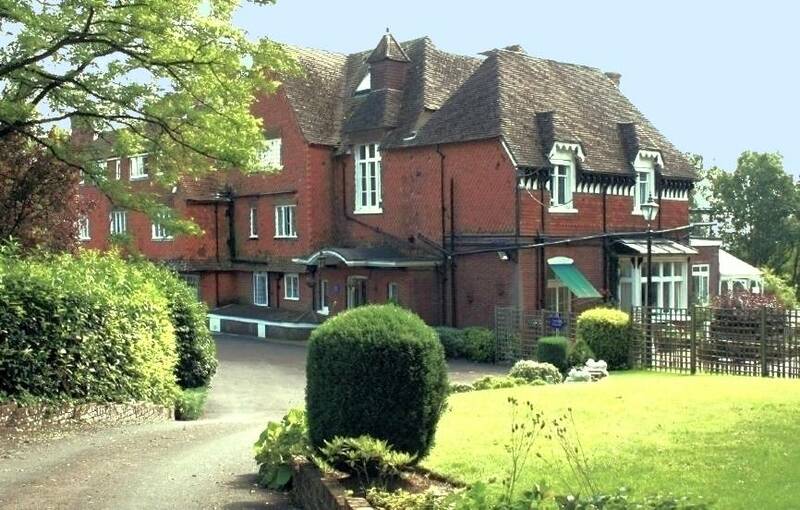 Care Homes of Distinction: Surrey Heights. Web. 15 November 2012. Cross, J. W., ed. George Eliot's Life as Related in Her Letters and Journals, Vol. III. New York: Harper, 1885. Internet Archive. Web. 15 November 2012. Cundall, Herbert Minton. Birket Foster, R. W. S.. London: Adam and Charles Black, 1906. Internet Archive. Web. 15 November 2012. "Henry Hardy Cole (1843-1916)." Christie's. Web. 15 November 2012. Huish, Marcus B. Happy England as Painted by Helen Allingham, R. W. S.. With Memoir and Descriptions. London: Adam and Charles Black, 1903. Internet Archive. Web. 15 November 2012. Nairn, Ian, and Nikolaus Pevsner. The Buildings of England: Surrey. Harmondsworth: Penguin, rev. ed. 1971. Print. Sheppard, F. H. W., ed. "'The Exhibition Building of 1862," Survey of London. Vol. 38: South Kensington Museums Area : 137-147. British History Online. Web. 15 November 2012. _____, ed. "'Royal College of Organists," Survey of London. Vol. 38: South Kensington Museums Area : 217-219. British History Online. Web. 15 November 2012. Short, Brian. England's Landscape: The South-East. London: Collins/English Heritage, 2006. Print. 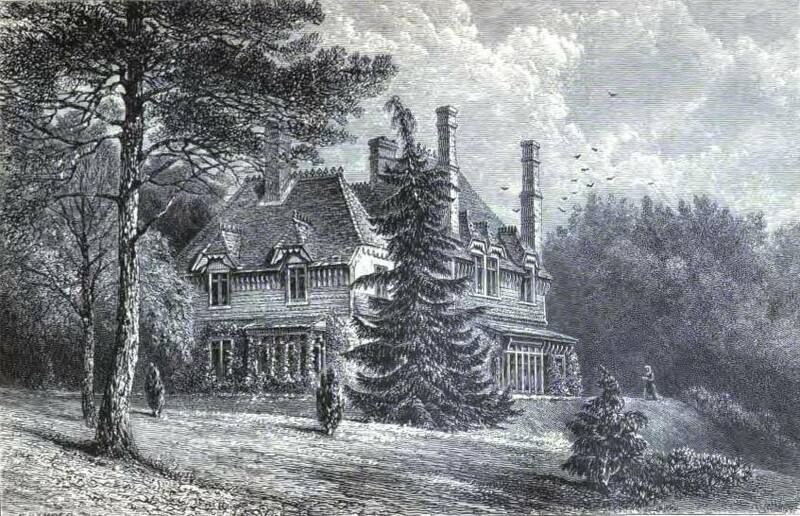 Trotter, W. R. The Hilltop Writers: A Victorian Colony among the Surrey Hills. Illustrated ed. Headley Down, Hampshire: John Owen Smith, 2003. Print.